Directions: Likely you will end up here by plane at Jeju International Airport in Jeju City at the northern end of the island. We took a taxi to our hotel in Jungmun a resort town on the southern coast. Car rental is also available at the airport. The ride from the airport will take you around the western portion of the island through towns and farmland. 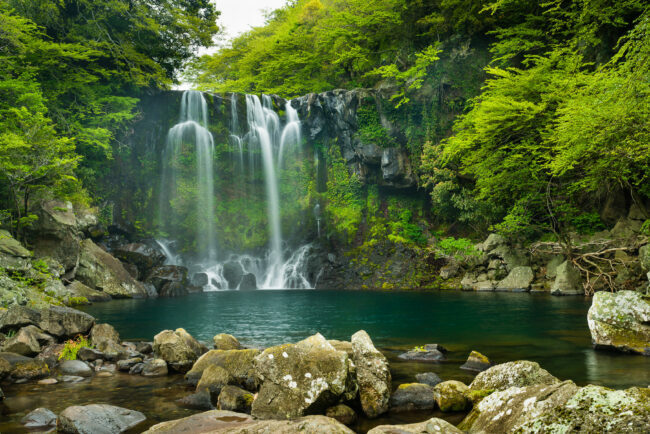 Just at the corner of Jungmun there is Cheonjeyeon Falls, a beautiful park with three sets of waterfalls with each location accessible by paved trails. The trails themselves can get crowded during peak hours but there is room at nearly all of the waterfalls to set up even a large tripod and snap a few pictures with a little patience. To get the flowing water I used a 2 stop ND filter, set the ISO to the lowest possible setting (50 on my camera at the time) and shot the photo at f/8.0. I found from the distance from the viewing area normal focal lengths were nice in framing the scene (35-50mm). The Featured image shot at Cheonjeyeon’s 2nd set of falls shot on a 35mm f/1.4 @ f/8.0, ISO 50 and 0.8 secs. 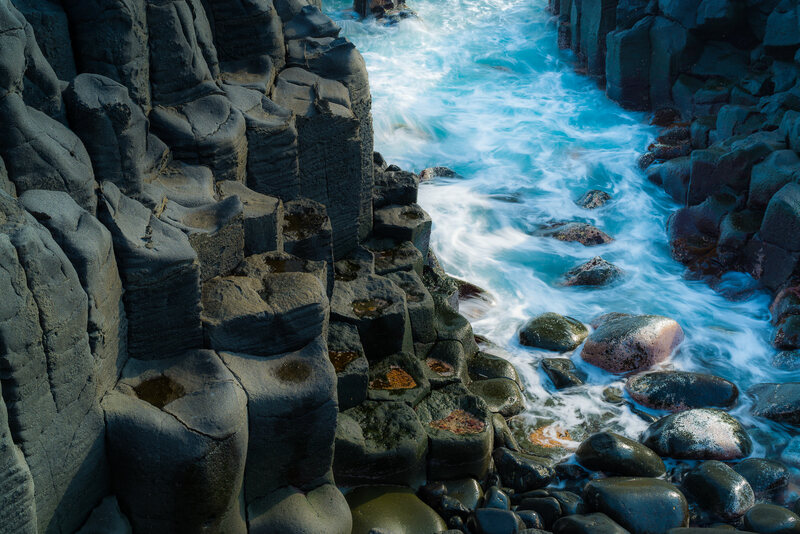 Next I walked down to the coast from the park to the shore to explore the lovely geometric shapes of the basalt volcanic rock formations. While there are a multiple places with scenic overlooks of the coast, I highly recommend wandering off the trail at times (with caution as some cliffs are quite high) to relax and take it all in. Again a sturdy tripod doubles as sturdy support for your camera and an impromptu walking stick while traversing the rocky shore. Lastly I made the 2.4 mile trek through small towns and neighborhoods to find the breathtaking Yakcheonsa Temple. 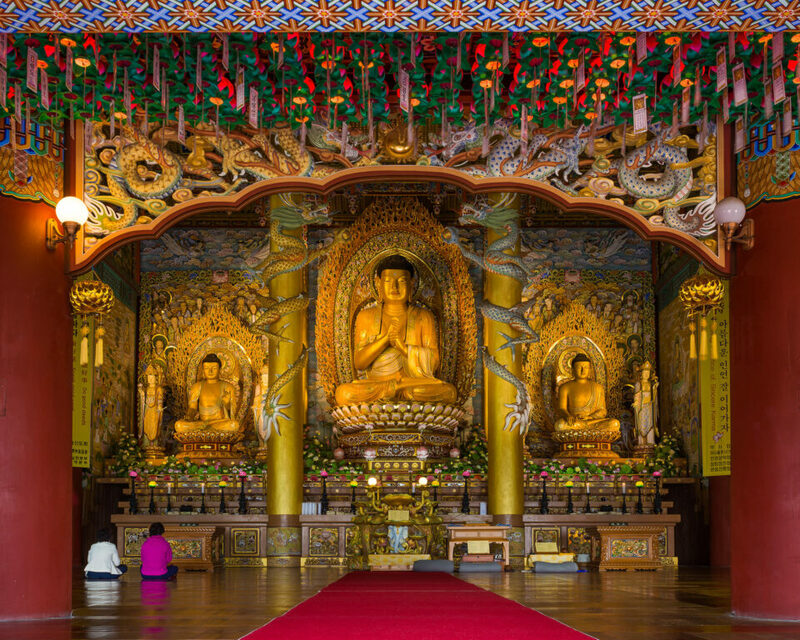 This large Buddhist temple has many photogenic vistas to behold including the stunning architecture of the temple itself but the real gem was the incredible large golden Buddha statues inside. Since people were actively worshiping and praying in the temple while I was there, I simply stood at the entrance with my tripod, my 35mm lens set to a f/8 and fired multiple shots from the doorway to capture a scene without people moving too much in frame. 1. I highly recommend bringing a nice sturdy tripod to get the most of these dimly lit wonders while traveling. 2. If you are walking to all these locations, a sharp standard zoom (24-70) or a few primes (24, 35, and 50) were more than sufficient for what I was shooting. 3. Try and take multiple safety shots as roaming people during some of the longer exposures may leave undesirable “ghosts” in your images. 4. For all outdoor locations a circular polarizing filter was a must for those punchy colors especially in spring where rain can leave surfaces extra shiny and blown out.